Harry Bates and John McCarthy maintain their lead of the Make Smoking History Forest Rally with just two stages to run. Toyota Gazoo Racing Australia’s dream run has continued through Sunday, with teammates Lewis Bates and Anthony McLoughlin in second in the opening round of the CAMS Australian Rally Championship. 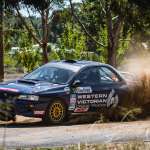 Western Victorian Crane Trucks’ Darren Windus and Daniel Brick now sit third in Heat 2 after an impressive morning in their Subaru Impreza WRX – Windus pleased with his progress on the fast forest roads. There have been some dramas throughout the field, with Subaru do Motorsport’s Molly Taylor and Malcolm Read suffering engine issues which has caused their times to fall – but the team expect to fix the Subaru in the midday service break and expect to be able to finish the rally. It was a disappointing morning for Shamrock Haulage’s Richie Dalton and Dale Moscatt, who rolled their car on SS16 – thankfully, the Ford Fiesta crew are reportedly ok but their rally would now appear over. Organisers have confirmed today’s final stage will not run due to timing issues, meaning just two stages remain before a winner will be crowned.